A white woman in her 50s presented for evaluation of recurrent gingival ulcers of 8 years’ duration. She reported that at the time of initial onset, multiple painful ulcers had appeared on the anterior maxillary gingiva. She stated that the lesions had resolved spontaneously without treatment but recurred 8 years later as swelling and ulceration of the maxillary and mandibular gingiva. She denied involvement of cutaneous surfaces and reported a history of ligneous conjunctivitis since childhood (Figure, A). Her medical history was significant for hypothyroidism, seizures, and functional heart murmur. Medications included levothyroxine sodium, mometasone furoate, levocetirizine, and benzonatate. Review of systems was significant for easy bruising and prolonged bleeding. Intraoral examination revealed generalized mild edema with rolled margins of the maxillary and mandibular gingival accompanied by nodular ulceration of the left maxillary gingiva (Figure, B). 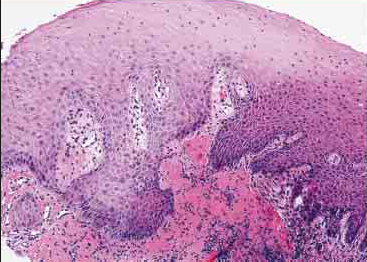 Biopsy specimens were obtained from the gingival ulcer (Figure, C and D) and buccal mucosa for routine histological and direct immunofluorescence analysis, respectively. Also obtained were a complete blood cell count with differential and comprehensive metabolic panel; no abnormal findings were identified.